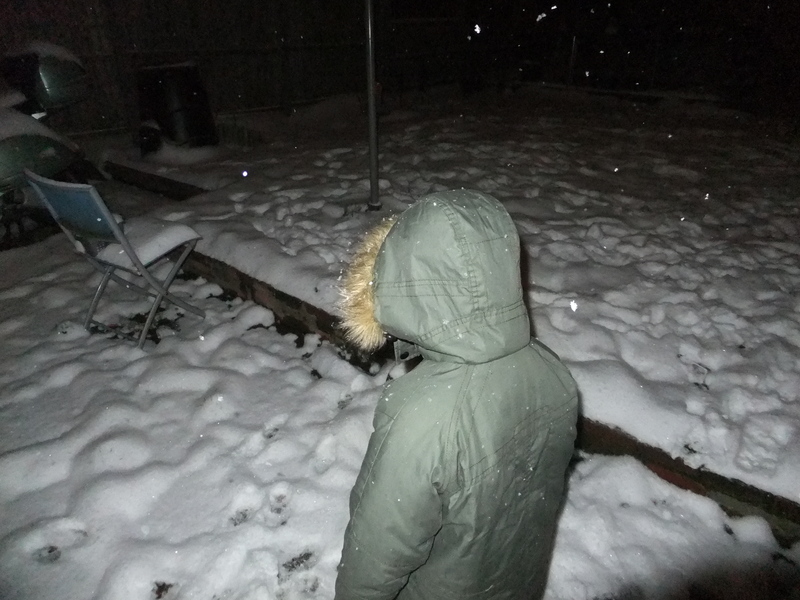 18/12 – Snow, Snow and Snow!! Munch had a good sleep and we didn’t get up till 9.20 this morning, bliss. The was still a little bit of snow on the ground from the day before, not long after we got up it started to snow again and it gradually got worse and worse until I was like a blizzard, Munch stayed in the living room oblivious to all this, alternating between the computer and TV. When daddy got up daddy gave him his Christmas card from Nanny, Much was extremely happy when £40 fell out, we still owed him last weeks pocket-money and we said that because it will be Christmas Day next Saturday that he could have this weeks and next weeks as well and that we would put an extra pond to it to make £10, so £10 given Munch was very excited when he added his 2 £20 notes and his £10 note that altogether he had £50. We were going to go to Kid’s Space later and said that we would call into the Entertainer whilst there, but the snow kept coming, so in the end we decided not to chance it and we stayed in all day. The rest of the day went in a blur of TV and computer, Munch was getting a bit stir crazy and was getting to be a bit hyper, and had to be asked several times to calm down, he was sent to play upstairs in his room for a while, after 1/2 hour he called us up to his shop, he had put post it notes all over his bedroom selling things, they were on everything, we could even buy his whole bedroom for £18!! I settled on a photo and a tube of Sudocrem at 10p each. We all watched the 1st part of Strictly Come Dancing and then Casualty, then it was bedtime for Munch. Something I forgot to put in the previous entry was that in the afternoon I received a phone call from the school saying that Munch had been in the office for about 15 minutes with a stomach ache, he was ok in himself, didn’t want to go to the toilet and had no temperature. I told the lady I was talking to that we had been having a lot of him saying he had tummy aches and headaches over the last few weeks and not wanting to got to school, once he gets there though he is fine. Me and hubby discussed this later and what we have realised is its been since the Christmas Decoration’s went up, this time last year they were doing lots of work with him about him coming to live with us, so we think that subconsciously he is worried that it is going to happen again, he has been unwilling to stay on his own in a room, constantly following us around of late so it’s like if he keeps us in his sight we wont go away,what our poor children have to endure.